With the Summer well underway in London we’ve found our stomachs again and Out For Lunch is raring to go. We love our Mexican food and hidden amongst the tourist traps in Covent Garden is a sweet authentic joint with a £6.50 lunch menu smashed full of options. Your friendly neighbourhood Mexican restaurant in the heart of tourist London. The Joint: Cafe Pacifico, 5 Langley Street, Covent Garden, London, WC2H 9JA. You can check out their website here. The vibe: With the great London burrito craze of 2013 behind us, where everyone was suddenly mad for pulled pork and salsa, we have been left with a glut of options in zone one. Those left standing are inevitably the chains, which aren’t a bad choice it must be said, but it still feels like cheating for us. Tucked away down Langely Street, home of the famous Pineapple Dance Studio, is a long standing joint that’s a secret worth knowing about. The lunch menu has a good selection of burritos, tacos, topped nachos, and fajitas and you feel spoilt for choice at first. It’s never easy to turn down topped nachos either but once you notice the honey glazed gammon tacos it’s even harder to turn those down. After a few complimentary tortilla chips, with some of the freshest tomato salsa we’ve tasted, our meals were soon with us. The gammon was sweet, the iceberg lettuce was crunchy, and the two choices of salsa (with salsa verde added to the earlier tomato salsa) were a nice touch. It worked brilliantly and the two hand sized tacos were more than enough for us. 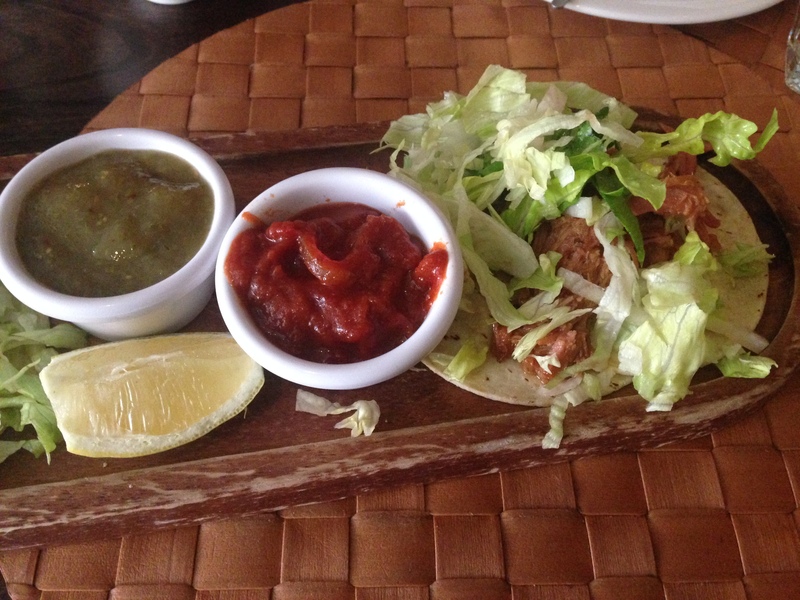 Glazed gammon tacos with cracking homemade salsa. Top stuff. Cafe Pacifico is dimly light, flooded with themed decor, and home to an impressive list of tequilla based cocktails. Their lunch menu is superb and from our experience you’ll not be waiting around for a table. We’ll be back to work our way through their lunch menu and we hope to see you down here. The price: £6.50 for the food, and £1.70 for a soft drink. Cafe Pacifico was visited by Tom in June 2014, and then repeatedly in July 2014 as it was such good value. 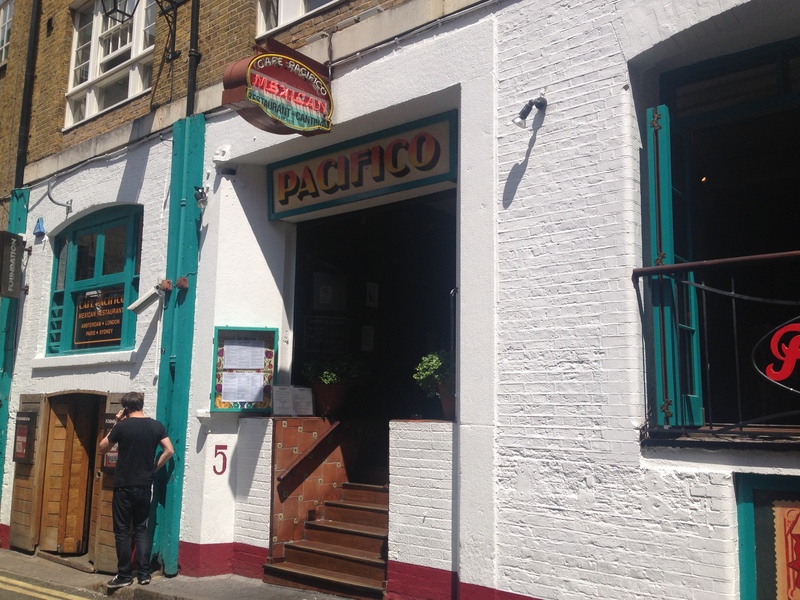 HAVE YOU EATEN AT cafe pacifico IN covent garden, LONDON? IF SO TELL US HOW YOU GOT ON OVER AT OUR TWITTER PROFILE – @OUTFORLUNCHBLOG. Posted in LondonTagged burrito, cheese, covent garden, fajita, Food, lunch, mexican, nachos, pulled pork, salsa, tacos, zone oneBookmark the permalink.